President Maithripala Sirisena must re-consider the appointment of K. Kader Masthan as the Deputy Minister of Resettlement, Rehabilitation, Northern Development and Hindu Affairs, UNP MP and Lanka Jathika Estate Workers' Union General Secretary Vadivel Suresh said today. He said the President should take into account the fact that Mr. Masthan was a Muslim. “It would have been better if a Hindu MP was appointed to be in charge of Hindu Affairs. Any one appointed to be in charge of religious affairs should be from the religion concerned and not from another religion,” the MP said. He said that the President, Prime Minister and Speaker should ensure that the names of the 118 MPs who had obtained money from Perpetual Treasuries Ltd. be revealed soon. What a bad decision to appoint a Muslim for Hindu affairs. It is nothing personal except Muslim beliefs, traditions and practices are diametrically opposite to those of Hindus. Could you imagine what the reaction would have been had Buddhist affairs been assigned to a Muslim minister! How about Aluvihare , who was appointed State or Deputy Minister of Christian "affairs"The guy is a Budhist!Now only thing lacking is a Hindu minister of Budhist " affairs"That will complete the Sanhindiya thingy! It shows how the rulers respect the others religions. 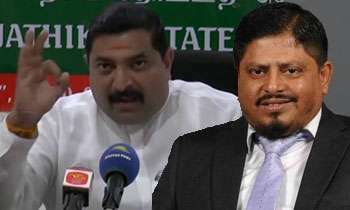 Sri lankan actor VADIVEL must ask the president to remove Masthan's Hindu affairs and to be appointed a Hindu guy is OK. Other ministerial affairs can be held with Masthan. President has done this with a scientific method as said by himself. This well planned single act is intended to drive a wedge between the Hindu and Muslim community who are both minorities. Whether Masthan does a proper job or not, there will be grumbles and complaints against him. The minister should tread very carefully between his ministry and his own faith, without harming either.